The next exhibit in the Green Gallery at The Scrap Exchange opens Friday, July 18 and features paintings by Allison Tierney. Tierney’s work relies heavily on geometry to produce the illusion of controlled environments – from bold clean-cut lines above the surface of the painting to complex, layered compositions. “I find harmony in the balance between the geometric and the organic,” she says. “I want these two opposing elements to be symbiotic, responding to one another and creating a stable-yet-fragile environment.” While looking at one of Tierney’s pieces, a viewer would be forgiven for wanting to climb into these paintings, to explore one of those environments firsthand. Tierney is an Ackland Fellow in pursuit of an MFA in Fine Arts at UNC Chapel Hill. Her work has appeared in Studio Visit Magazine and in galleries throughout the Carolinas. “Between Intuition and Reason” is the final exhibit at The Scrap Exchange’s current location. The Scrap Exchange will close from August 11-August 15th as operations relocate to a permanent home at 2050 Chapel Hill Road in Durham, and will reopen on August 16th. 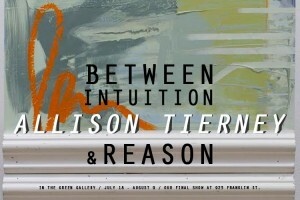 An opening night reception for “Between Intuition and Reason” will be held on July 18 from 6-9 pm with music, refreshments and art making. Green Gallery receptions and corresponding Third Friday activities are free and open to the public. For more information, call The Scrap Exchange at 919-688-6960. This project was supported by the Durham Arts Council’s Annual Arts Fund and the N.C. Arts Council, a division of the Department of Cultural Resources. Tagged Allison Tierney, art gallery, creative reuse, Durham, Green Gallery, paintings, reuse art, Scrap Exchange, The Scrap Exchange, Third Friday.